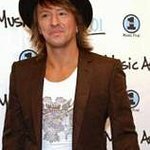 Richie Sambora is a solo artist and singer/songwriter/guitarist of Bon Jovi. He has sold over 130 million albums worldwide and has co-written over 20 Top 40 hits and 11 Top 10 hits. He was inducted into the Songwriters Hall of Fame in 2009. Richie’s new solo album Aftermath of the Lowdown, out now, illustrates the ups, downs and triumphs that Richie has experienced over the past several years as he has dealt with his personal struggles in the public eye. Previously, Sambora released two solo albums, Undiscovered Soul (1998) and Stranger In This Town (1991). Google trends for "Richie Sambora"
We don't have any videos related to Richie Sambora.